Victoria beaten by Kamloops 6-1; club continues road trip on Friday. 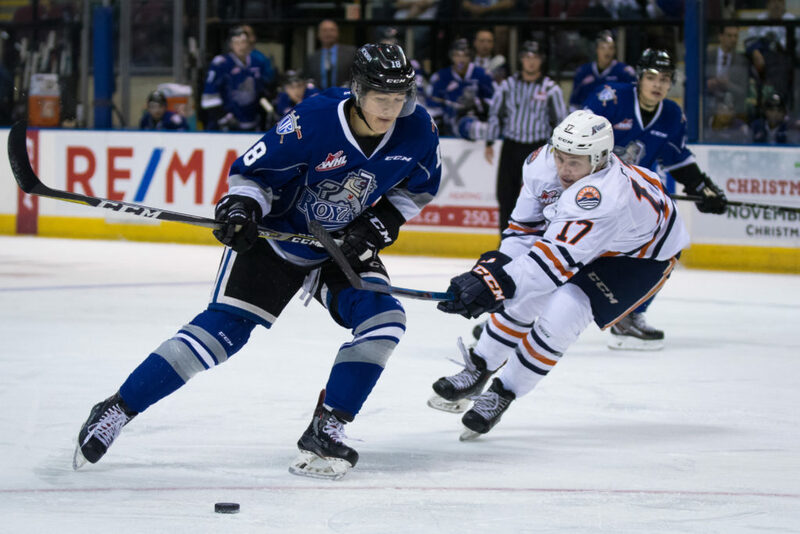 Kamloops, BC ­– The Victoria Royals were defeated by the Kamloops Blazers 6-1 on Wednesday night at the Sandman Centre. Royals – Phillip Schultz 1g-0a, Scott Walford 0g-1a, Dino Kambeitz 0g-1a. Kamloops – Connor Zary 3g-0a (Game Winner), Jermaine Loewen 1g-2a, Zane Franklin 1g-1a, Montana Onyebuchi 0g-2a, Brodi Stuart 1g-0a, Orrin Centazzo 0g-1a, Jerzy Orchard 0g-1a, Jackson Caller 0g-1a. Royals – Brock Gould (L) – 11:42 mins, three saves on five shots. Griffen Outhouse – 48:18 mins, 26 saves on 30 shots. Kamloops – Dylan Ferguson (W) – 60:00 mins, 36 saves on 37 shots. Royals – 1/6 = 16.7%. Kamloops – 1/3 = 33.3%. Powerplay Prowess: With Victoria’s powerplay goal in tonight’s game, the club has now tallied at least one goal on the man-advantage in four straight contests. On a Roll: Royals’ defenceman Scott Walford registered an assist in tonight’s contest. Since the Royals returned from their Eastern Conference road trip on January 9th against Kamloops, he has recorded 19 points (6g-13a) in 17 contests. During this span, Walford is fourth among WHL defencemen in scoring. Hot Streaks: In tonight’s contest, the Victoria Royals had a duo of players extend their active point streaks. Scott Walford tallied in assist, to extend his streak to five games, in which he has recorded two goals and six assists. Meanwhile, Phillip Schultz has picked up five goals and three assists in his last four games. Up Next: The Royals will conclude their five-game road trip when they head to Prince George to take on the Cougars this Friday and Saturday night. Coming Home: Victoria returns home on Monday, February 18th, and Tuesday, February 19th to battle the Kelowna Rockets in a back-to-back set. Monday’s Family Day game will start at 2:05 p.m., with a Skate with the Players taking place after the contest. Puck drop for Tuesday’s game is at 7:05 p.m. Tickets can be purchased in person at the Select Your Tickets box office, over the phone by calling 250-220-7777, or online at www.selectyourtickets.com.